NEEDHAM, Mass., Sept. 17, 2018 /PRNewswire/ -- TripAdvisor (NASDAQ: TRIP) today unveiled a new site and mobile experience launching later this year. Currently in beta, the world's largest travel site* is evolving to become the most personalized and connected travel community, inspiring and empowering individuals with social assistive tools to plan and book better with relevant advice and information from people and experts they trust. Click here to watch the presentation. The new TripAdvisor expands its community beyond travelers to also include brands, social media influencers, publishers and friends. Travelers can follow and connect with individuals or content creators who share information that is relevant to their interests. Complementing our more than 661 million reviews and opinions, TripAdvisor members will be able to create and view inspirational and helpful new forms of content including photos, videos and articles. Members will also have the ability to create "Trips," which can be in-depth travel guides, itineraries or simple wish lists of things to do while traveling. Trips can be made private and saved for personal use or shared with the community to inspire and help others. Powered by the world's first "travel feed," TripAdvisor members will be able to discover more relevant information faster when planning travel. Assisted throughout the entire travel planning process, members can draw advice and inspiration from their friends, family and trusted experts. When a member logs onto the TripAdvisor app or site, their homepage transforms into a personalized feed of information. When searching a particular destination, the feed automatically narrows the scope of the information displayed to that particular geographic location. For example, members planning a trip to Paris may see a food critic's article on the best restaurant in the city, an influencer's travel guide of "must-do's," and a friend's review of a new hotel near the Eiffel Tower. 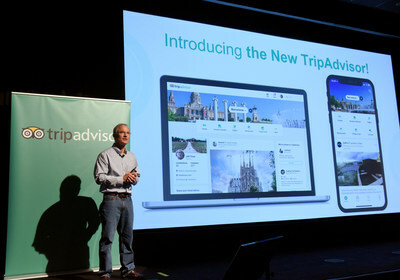 "TripAdvisor is poised to disrupt the travel industry once again as we create a more personalized and connected community," said Stephen Kaufer, CEO & co-founder of TripAdvisor. "The new TripAdvisor is the one travel site that brings together social-assistive tools, amazing content and our existing booking capabilities to merge the joy of planning and discovery together into a single experience. We are assisting our members at each step of their journey as we become a more personalized, inspirational and useful TripAdvisor." While in beta, more than 500 social media influencers, well-known consumer brands, publishers and travel partners have joined the new TripAdvisor — with more being added every day. In addition to the many content creators joining the platform, TripAdvisor's team of destination experts and TripAdvisor Media Group brands, including Smarter Travel, Cruise Critic and TheFork.com, will also contribute to the site experience through unique profiles. Members will be able to follow favorite brands like National Geographic, Condé Nast Traveler, Travel Channel, Business Insider & Insider Guides, PopSugar, Great Big Story (CNN Travel), Pandora Music, GoPro, Goop, NYC & Company (via their consumer-facing tourism website, nycgo.com), Nashville Music City, and The Knot, among many others. Members will also be able to follow leading social media influencers like television personality and restaurateur Giada De Laurentiis, as well as travel bloggers, like TravelBabbo. "National Geographic wants to reach our customers wherever it is they are consuming content. We want to be available on all platforms allowing people to engage with our brand and content wherever and whenever they choose," said Chris Thorman, Vice President Community Products & Growth, National Geographic. "We're excited to be among the first publishers to join the new TripAdvisor, further expanding our travel footprint. As a global media company, we're always seeking new opportunities to share our awe-inspiring articles, photos and video content, and a partnership with TripAdvisor allows us to do just that." TripAdvisor has unveiled its new site and mobile experience at a time when the company's impact on the travel and tourism industry is massive and growing. Two recent studies show a growing reliance on TripAdvisor during the travel planning, booking (pre-trip and in-destination) and post-trip experience. According to a 2017 Oxford Economics Study, the TripAdvisor platform has influenced $546 billion USD (10.3%) of global tourism spend annually in the travel and hospitality industry as consumers sought our review content as a part of their decision-making process. A 2018 study from comScore found that 60% of people booking travel online went to TripAdvisor during the travel planning and booking process, and a full 74% of travelers used TripAdvisor when booking on hotel websites.